Sitetriks Puts You in Control. Whether you’re a small business or an enterprise-size organization, Sitetriks is designed to scale and flex in order help you achieve success. Sitetriks enables content personalization, dynamic content distribution, version control and over 30 more business-enhancing features right out of the box. Sitetriks is poised to help your business achieve higher rates of user engagement, more fluid interactions and better business outcomes. It's been created with the clarity and understanding of what high-performing, savvy professionals demand. Sitetriks is certainly the new kid on the block, sporting all the cool bling. It's built on the latest Microsoft ASP.NET Core framework, offers a modular architecture, enables easy integration of custom functionality and is mobile optimized on the front and back. Not to mention it is 3 to 6 times faster than the industry leading content management systems - seriously! The web is a visual-first environment and so is Sitetrilks. Sitetriks Admin allows you to see and manage page content, page layout and page structure all from a single screen in edit mode. This translates into more control over content presentation, higher productivity and huge time savings because it’s right the 1st time - one edit and done. 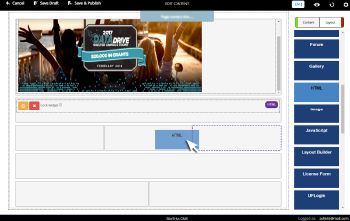 Add Widgets to pages using the drag and drop interface. Sitetriks provides a suite of native widgets you can drag, drop and move around until you are satisfied with the content and order of the page. It also allows you to add custom widgets to your suite of widgets options. 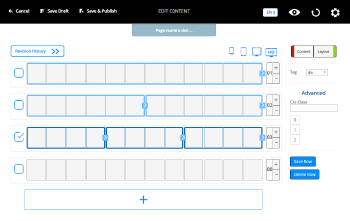 Sitetriks empowers you to create a layout and page structure in just minutes. It allows you to choose number of columns, rows, variations within each and it enables you to choose how the layout is presented across different devices and browsers. And Sitetriks does this without you having to write one single line of code. Do you have HTML from an ad, email or maybe a gateway page that you want to display on your website? 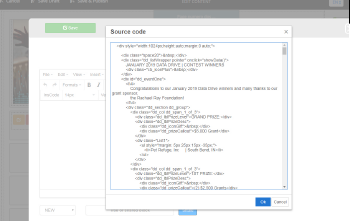 Sitetriks allows you to copy/paste that code directly into an HTML widget and presto, there it is. It does it without creating conflicts or making you intrduce work-arounds. If you're interested in a more technical look at the product and want to know "what’s under the hood" ... let's talk tech! Can I manage content from my mobile device? Yes, Sitetriks is mobile optimized both on the frontend and the backend, so you can easily login to the Admin and update content from anywhere. Sitetriks is designed with speed and mobility in mind, so there will be virtually no waiting for content to update or load when you login from your tablet or phone. Sitetriks may be your SEO BFF. It allows you full control over page properties, including page title, page description, keywords, page URL and more. Sitetriks also dynamically generates a sitemap that is based on Google best practices and requirements. Can the content from my current website be migrated into Sitetriks? Absolutely! Depending on the CMS platform you are currently using, we offer various data migration options and tools. Please email us to describe your specific need and requirements and we will be happy to provide you with options to accomplish your goal. What license options are available and how much do they cost? Can I build on Sitetriks Community edition and easily upgrade later? Yes, the beauty of Sitetriks is it allows you to cherry pick the features and benefits you want and forego the rest. You can build on the Community edition and then easily upgrade to the Professional or Enterprise edition. Likewise, you can build on the Community edition and choose to purchase add-ons in an a la carte fashion. It's completely flexible, completely modular and completely your choice. How long does initial setup require? Once you have downloaded the Sitetriks installer and made sure your system requirements meet the minimum spec, setup only takes a couple of minutes. What are the requirements for the development environment? What are the requirements for the server environment? Sitetriks is a .Net Core application that can be hosted on any environment that supports .NET Core applications. Here is a link to Microsoft's overview on the subject of hosting .Net Core applications. How will upgrades to new Sitetriks releases by accomplished? The Sitetriks goal is stay current with the latest standards to enable the highest level performance, best user experiences and access to the latest proven technologies. As such, each major release will be accompanied by a clear, simple upgrade path that includes documentation and migration tools (as needed). Sitetriks is a fully supported platform that aims to deliver outstanding support, innovation and exceed customer expectations.